Former pro-football kicker Sam Ridge has notoriously bad luck with women—from cheaters to fame chasers. Still, the gorgeous brunette at the bar in Fool’s Gold looks harmless—until she takes him home and he discovers a room devoted to securing a man, for life. Dellina Hopkins never guessed that storing gowns from a friend’s bridal boutique would chase away her first and only fling. After her parents died, she skipped her “wild youth” to raise her sisters. She doesn’t want forever from Sam, but one night—all night—would’ve been nice. His clean getaway gets messy when his firm hires Dellina to plan an event. As long hours lead to late nights, the two succumb to temptation again. Has Sam’s luck finally changed? Or this time, will Dellina be the one to run? 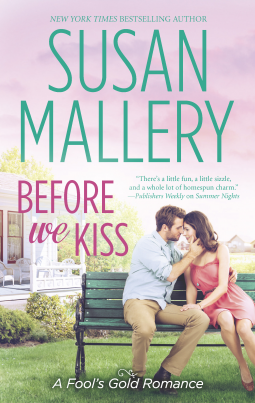 Susan Mallery’s books are just fun to read. Yes, there is some headboard rockin’, but there is also an enjoyable story with characters you get to know. They make you feel like love is possible for anyone. In this case, Dellina and Sam are clearly meant to be, even if he hightails it out of her home quicker than you can say, “I booked the reception site.” The second he sees all of those wedding gowns and a whiteboard that lists out steps for getting a man to propose, fear of commitment grips him tighter than Super Glue. Up till that point, he and Dellina had enjoyed a lovely evening (indeed), so when he sees her again, memories of their encounter get his blood stirring. Hers, too. The two of them are skittish, though, when it comes to matters of the heart. Sam’s been burned by trusting the wrong women, and Dellina’s life is all about Responsibility. The one time she decides to have fun, the guy runs away. As they push and pull their relationship, they get to know each other, and those passages are fun to read. The supporting case of characters is quirky but not in a silly or demeaning way. For instance, Dellina’s sister – the one desperate enough to get her fiancé to propose that she has a “How To” board – is annoying and frustrating, but in that way that sisters are. She knows her behavior is ridiculous, but she can’t stop herself. Steely-eyed Mayor Marsha shows us that there is more to her than coordinated business attire. In fact, I think I’d like to see someone come in and whisk her off for some hot headboard rockin’ of her own. I enjoyed the heck out of this book, largely because I enjoyed Sam and Dellina so much. Mallery has a way of creating characters you want to be friends with and situations that are believable and relatable, while still being romantic and, yes, hot.